In this cyber week, there are a lot of gift card deals on eBay. Even if a deal is not for the card for stores you are not really interested, just buy the cards and sell them to gift card exchange sites, and you can make a little money. For example, Gap. 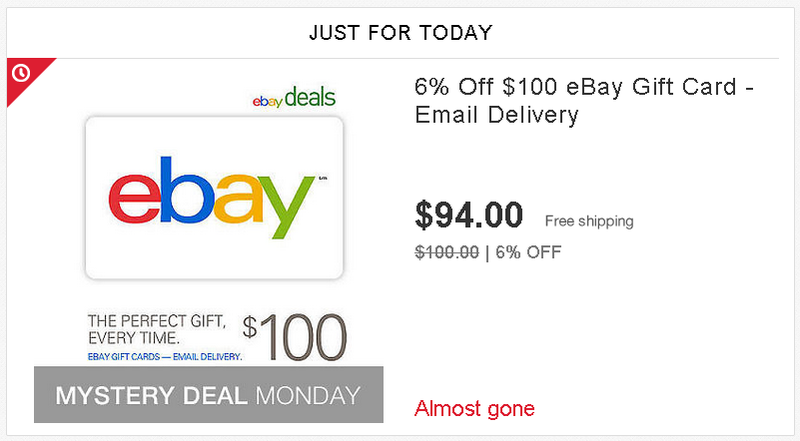 This week, eBay sells $100 Gap gift card (email delivery) for $80. Limit to 2 per person. It is 20% discount deal!. Gap gift card is relatively popular. So, you can expect a good price for sale. You can check the price and find the best offer at giftcardgranny.com. When I typed “gap” in the search box, there were four hits, “Baby Gap” “Gap” “Gap Kids” and “Gap Option.” You can use all these gift cards at Gap. It’s very interesting that they deal with them separately and offer different prices. The best rate is 82.5% from Monster Gift Card for selling “Gap” gift card. There is one problem, though. They don’t accept e-gift card (e-code). To work around this, you may need to find the sites that allow you to sell e-codes. 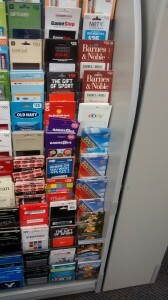 Cardpool, ABC Gift Cards, and GifCards accept e-codes of selected stores. While Cardpool and ABC Gift Cards accept e-codes at less price by 5% (of face value of GCs), GiftCards offer the same price as physical GCs. The rate of GiftCards for Gap GC is 80.5%. If you sell two $100 e-gift cards, the profit will be only $1. It would be OK, considering eBay Bucks you earned and cash back or reward from credit card that links to your PayPal account. I used eBay GCs for Gap e-gift cards purchase, which I bought with 10% discount earlier. However, I’d like to make the maximum profit. From my experience, the store’s GCs, which the sites (Cardpool, ABC Gift Cards, or GiftCards) accept both physical and electrical GCs, may have special features. For examples, you can combine all Target GCs with mobile app. You can also consolidate Best Buy GCs by purchasing a brand new Best Buy GC. And it works with Gap GCs as well. Gap GCs can be redeemed at not only Gap but also Old Navy, Banana Republic, Piperlime, Athleta. It means you can buy other store’s GCs with Gap e-codes. So, I needed to go back to giftcardgranny.com and check the rate again. After all, Monster Gift Card’s 82.5% for Gap GC is the best. I went to gap.com and checked out a $200 Gap GC. This comes with a decent gift card case. I bought $200 GC for $160 on eBay and sold for $165. I paid $160 with eBay GC that I bought with 10% discount. The total profit is at least $21. Plus, eBay Bucks and you may have earned cash back from a shopping portal site for e-code purchase on eBay. And you may also find a portal site that pays out cash back for Gap GC purchases at gap.com, but don’t abuse on this one. I’d better not use another eBay account to buy more GCs. That may probably be against their policy, and they would cancel all orders just like it happened to me two weeks ago. So, I purchased one code with one of my eBay account. The delivery was fast. Within 15 minutes, I received an email with the gift code in my PayPal registered email address. 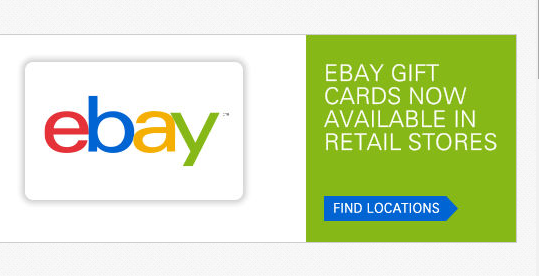 You can buy eBay GCs with eBay GCs. If you want a physical card, you can buy it later. Since Oct 22nd, eBay is offering a good deal on Sears gift cards. Until yesterday, the discount was 10%, but it is more discount now. However, there is no error message today. I guess eBay consider today’s item (Sears GC) is different from the item being sold until yesterday. Anyway, I was able to check out $200 GC. The time of writing this post, several hours have past. I haven’t gotten any warning message from eBay. And, maybe I can buy more. When I add $100 GC to the card, there is no error message. 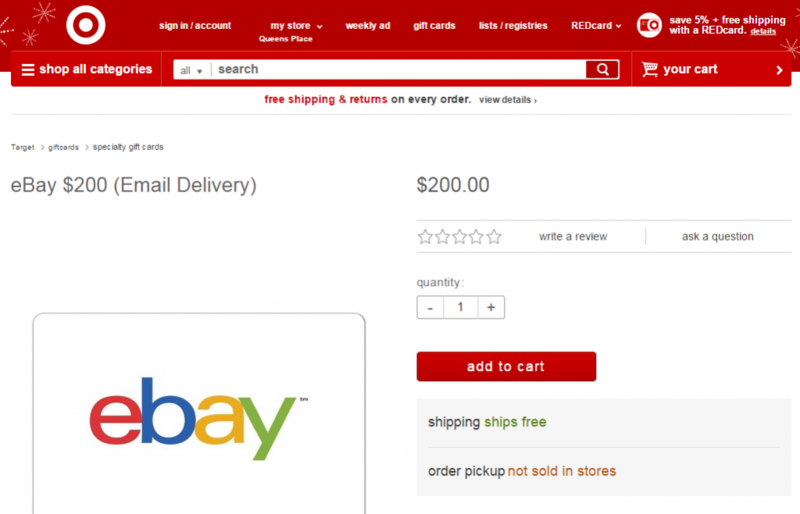 The listing doesn’t say “the limit is $200″, but “limit 1 or 2 per eBay user ID” on each listing page. I guess eBay considers these two items as different items. So, maybe I can buy another $200 (2 x $100 GCs). I didn’t check out, though. To be safe, I will wait till the $200 GC is shipped. The deal may be going to end by then, but I just don’t want another problem. I received email on Oct 22nd, and it said “Today Only.” But the deal has existed since then. 10% Discount Sears Gift Card on eBay. Limit two $100 GCs or one $200 GC per person. 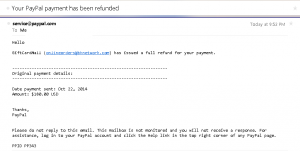 Today, I received email from PayPal that told me Giftcardmall had issued a refund. As you see, there are four emails. eBay canceled each transaction of each ID. As long as I can tell, you can’t buy more than $200 Sears GC during the promotion with multiple IDs and ONE PayPal account. I don’t know if you can buy more when you use different PayPal addresses as well as eBay user IDs. Now I know I had lost the deal, and it’s not retrievable. If you haven’t bought yet, don’t try to buy more than the limit or lost all deals. Today (10/22) only, Gift Card Mall on eBay sells $100 Sears gift card for $90. 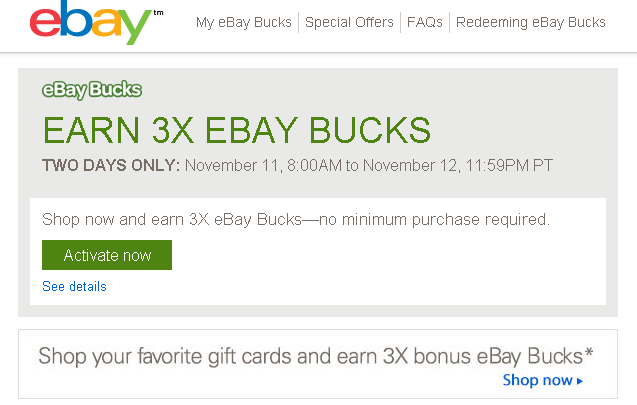 Limit 2 per eBay user ID, which means you can buy more than two if you have or create another eBay user ID. I have four IDs in total. Three for selling and one for buying. I checked out two gift cards each through all IDs I have. So, I purchased (8) $100 Sears gift cards in total. In addition to 10% off deal, you can also earn 2% eBay bucks! I noticed after check-out, but they sell $200 GC, too. If you choose $200 GC, the limit is 1. So, whichever you take, you can buy up to $200 per eBay user ID. 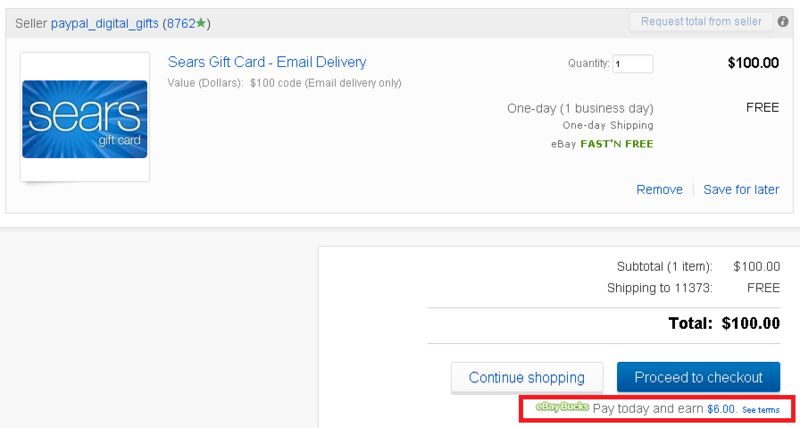 If you want to create another eBay user ID, it is very easy. All you need is different email address from one you use for your main user ID. You don’t have to create another PayPal account. You can use the same PayPal account when you purchase through any user ID. And I used the same PayPal account for the purchase of Sears GCs without problem. 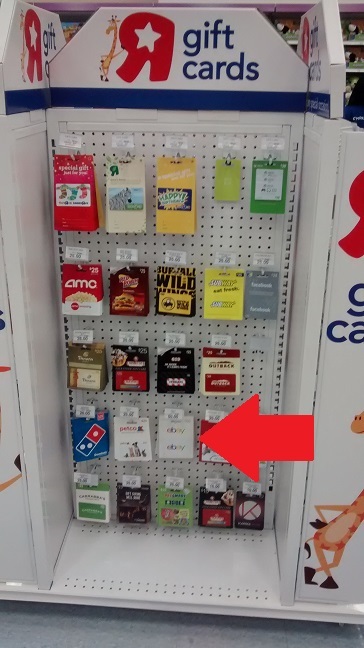 The gift cards are physical cards. And they offer free shipping as usual. I don’t know if they will combine all eight GCs. If they do, a total value exceeds $250, and someone will need to sign to receive. And most likely, they ship with UPS. If they send separately, they probably use USPS, and you don’t need to sign to receive. You can redeem GCs at Sears and Kmart, in-store and online. Hurry, it ends today! Please note that I thought it was OK to buy more than 2 GCs through different IDs, but I received warning message from eBay hours later. We’re pleased to have you as part of the eBay Community. However, we are contacting you regarding a violation of eBay?s Site Interference policy. Listings promoted on the eBay Deals have a limit on the amount of items you can purchase, primarily to maintain an equal marketplace for all members and allow other eBay members the opportunity to take part in the eBay Deals. Using multiple accounts to circumvent this limit is a violation of eBay policy. We have become aware of purchases using multiple accounts associated to you that exceed the quantity allowed per buyer. We understand that you may not have been aware of this policy, and we invite you to learn more about this policy at the link below in order to keep your experiences on eBay pleasant and successful. 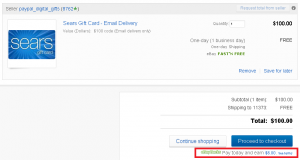 You are still welcome to purchase from the eBay Deals section, but you are advised to limit your buying activity to use of a single account when doing so. The items you purchased by violationg the policy will be cancelled at this time. Please be aware that additional violations of this policy may result in your further purchases being cancelled and a restriction of your buying privileges. We appreciate your understanding. I’m not sure they will cancel all of them or leave first one and cancel the other ones. It seems they will cancel all of them because exactly the same message were sent to all email addresses. So, DO NOT buy more than 2 by using multiple IDs. At the time of receipt of the email, purchase history of all my eBay accounts doesn’t show about a cancellation. Updated on 10/29/2014. 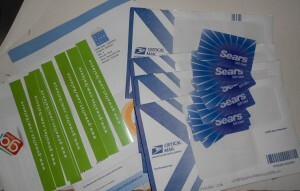 I received eight Sears GCs in four envelopes (2 GCs each). I checked the balance of gift cards, and they all have $0.